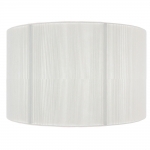 A striking, stylish silky string, cylinder drum lampshade in black with an opaque white PVC inner. Lampshade is available in a variety of sizes; please select as appropriate. Size: 10" 14" 16" 8"